The length of a tick’s life cycle will depend on what species it actually is. There are species that undergo the four life stages of a tick: the egg, larvae, nymph and adult stages, requiring only three hosts to feed on and the life cycle would only take at least a year to be complete. Other tick species on the other hand will undergo a number of nymph stages, each requiring a different host to feed. Usually, it undergoes as much as seven stages. This kind of life cycle may take months up to years. When the nymph is done with its blood meal, it drops off to the ground, digest its meal and continue with its development into the next or final stage. The nymph will finally molt or shed its skin to become an adult tick. These adults will then have eight legs, compared to the six legs of their previous life stages. Ticks belong to the arachnid family, hence having eight legs just like spiders. Generally, the ticks at this adult stage are about the size of a sesame seed. Ticks belonging to the Ixodidae family are distinguished by their hard shield hence they are called hard ticks. These ticks actively find their new blood hosts during the cool months of the year. They again position themselves on grass stalks and other plant forms for about 3 feet, waiting to latch onto their next host. The adult tick’s preferred hosts are larger mammals such as horses, deers, dogs, cats and even humans. When winter nears and the tick has not found a suitable host, they become inactive during the cold temperatures and resume seeking hosts when temperature rises. Studies have found that 50% of ticks from endemic areas carry transmissible diseases such as the Lyme disease. Although only a few human cases are found to be caused by adult ticks because they are larger in size compared to the other life stages, therefore can easily be seen and removed before it even transmits the disease. Most cases suggest that ticks must be attached for about 36 to 48 hours before transmitting the Lyme disease. Other diseases however need only about 4 hours or more to get transmitted. Ticks in this final adult stage are the ones responsible for the reproduction of the species. Adult females will attach to the host and feed often for about a week. They will also feed for more than 24hours before mating because ticks also need blood in order to lay eggs. Male ticks however only feed occasionally. A male tick’s size is only a fraction compared to an engorged female adult tick. Mating may take place on the host or off it, depending on which type of species. Often times, males die after mating while the female dies after laying thousands of eggs. The number of eggs may reach for about 3000 or more. Female ticks drop to the ground to find a perfect spot to lay her eggs, while other species lay their eggs on the host. 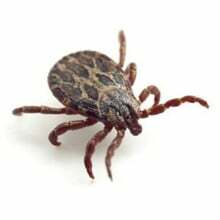 Some female tick species like the soft ticks, do not die after laying eggs for they lay several times, eating several blood meals. Regardless of the type of tick, complete and careful removal is essential to prevent further damage or complications. Ticks are best removed with the use of tweezers. It is used to grasp the tick as close to the skin as possible, pulling it straight out in a slow and steady yet firm way. Crushing, jerking or twisting must be avoided so as not to leave any tick mouthparts and to prevent the tick from regurgitating infectious materials. After successful tick removal, wash the area with soap and water. One may store the tick to help health professionals come up with a diagnosis in case of an infection.